In September 2017 Callebaut announced there is a new type of chocolate - ruby chocolate! It's the 4th type, adding to dark, milk, and white. It is made from the Ruby cocoa bean, and has a natural fruitiness and is also naturally pale pink in colour. Nestle have started using this chocolate to make KitKats, and they first launched them in Japan. However, they are now available in the UK (exclusively in Tesco), so I just had to try! So, what did I think? 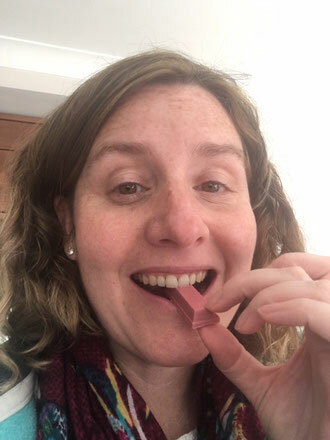 Well the chocolate on the KitKat is pale pink in colour, and so I was expecting a sickly sweet strawberry flavoured chocolate. But it's not at all. It's got a berry fruity taste, and is richer and not so sickly. And it's a definite taste of berries, not just an undertone, which considering there is no flavour added I was quite surprised by. So, all in all, I was pleasantly surprised and would definitely buy them again. The price was 80p for a 4 finger KitKat, which compares to 60p in Tesco for a regular 4 finger KitKat. That leaves me with one question....I wonder if Cadbury will launch something soon with the ruby chocolate too?